That’s the first word that comes to mind about my new spinning project. I finished my last project, the spinning and Navajo ply of BFL/Silk. I’m happy with the results, the practice was good. I learned that my primary issue was the tension on the bobbin holding the singles – once that was loose enough, the process was easy and the result was perfectly balanced. But now I’m ready for more COLOR!! So I have started on a brilliantly hued art batt from Crosspatch Creations that I bought at SAFF last fall. The colors are amazing. The fiber (wool, silk, and viscose) is sweet and soft, and has beautiful silk noils that pop both color and texture in the singles. I’m spinning it at 8:1, and fairly thin, so the inclusions and colors really stand out. The picture speaks for itself. 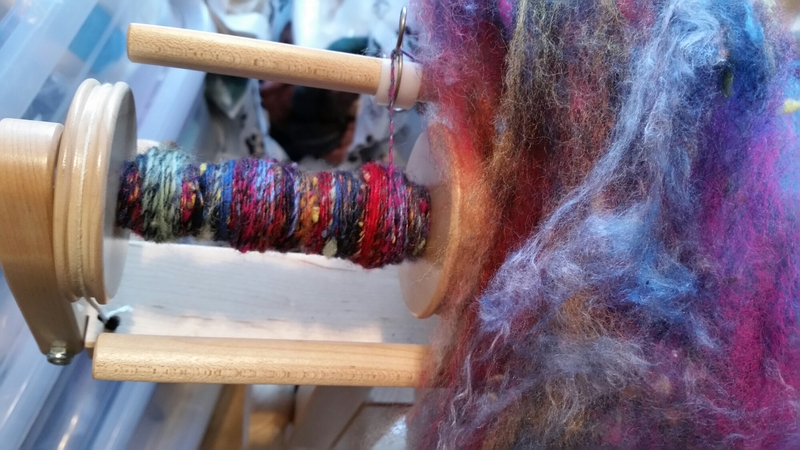 This entry was posted in Art, Fiber and tagged Arts, Batts, Spinning. Bookmark the permalink. One Response to Art Batts! !